Trolling in the name of patriotism? Whoever is behind Jihawg Ammo just needs to stop. The first sentence under the about section on the Jihawg website reads,”PEACE THROUGH PORK!”—a phrase that seems relatively benign and maybe even sensible. Seriously, we dare you to try and be mad at someone while going H.A.M on some Momofuku pork belly buns (no pun intended…okay fine, pun intended.) As meat eaters, we can relate to Anthony Bourdain as he evangelicizes piggy products at every opportunity possible. What we don’t understand, however, is when people decide to waste precious and delicious pork products on something is horrifically dumb and offensive as pork-covered bullets meant to ward off terrorists. Enter Jihawg bullets. The name is only the tip of the iceberg. These bullets, manufactured in Idaho, are coated in pork byproducts to fuel the most twisted notion of patriotism ever: By the manufacturers’ logic, pork products, traditionally not eaten by Muslims, will scare off radical Islamists who want to avoid losing their place in heaven by being pierced with something “unclean” like a porcine bullet. 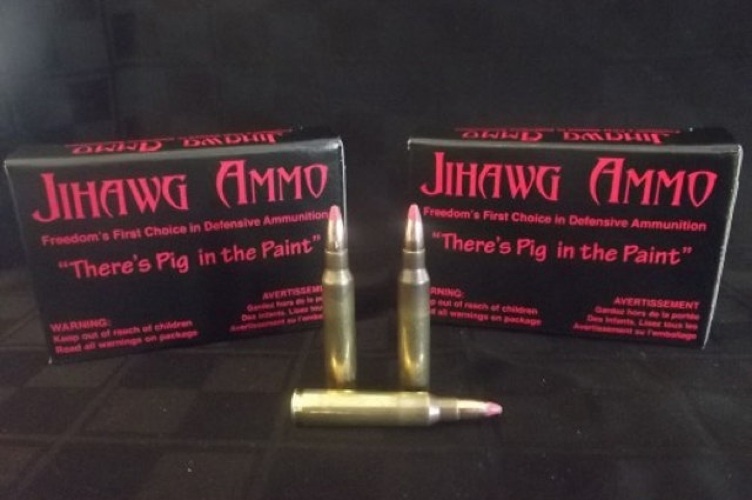 According to the website, “Jihawg Ammo is a natural deterrent to radical and suicidal acts of violence.” What possible flaws could there be in that well-researched hypothesis? Not only have the makers failed to actually protect themselves from those whom they deem radical Islamists, but they’ve also managed to offend an entire religion in the process. The horrifically discriminatory views litter the poorly designed site, which features copy such as, “It’s time to put some HAM in MoHAMed!” It’s definitely not. The only thing it’s time to do is learn how to not be a bigot.